← The CAG Report: the facts we do not know! Sorry! No ‘hostages’ there, Mr. Finance Minister! “61. Madam Speaker the situation with regard to the dormant Employees Provident Fund (EPF) accounts and the claim ratios of ESIs is too well known to be repeated here. It has been remarked that both EPF and ESI have hostages, rather than clients. Further, the low paid worker suffers deductions greater than the better paid workers, in percentage terms. We, first of all, thank Mr. Arun Jaitely that he has chosen to consult the stakeholders before making amendments to further his observations on ESI Scheme. In regard to his proposal to allow option to the employees to choose either ESI or a Health Insurance product, recognized by the IRDA, we have already brought out the well-known fact the medical benefit provided by the ESIC is just one of the many benefits and that it has close connection with important cash benefits like Sickness Benefit, Extended Sickness Benefit and also Sickness arising out of pregnancy and Sickness arising out of Confinement, Sickness arising out of premature birth of child or miscarriage. In the present write-up we would like to remind the Minister just one fact which might not have been brought to his notice by the overzealous bureaucrats who wanted to please him so that he could, in turn, please the private players who would be pleased if the ESIC, which affects their area of operation, is not there. The Minister has gone on record having said that the ESIC does “have hostages, rather than clients”. The fact is that the ESI Scheme is run by government. Mr. Arun Jaitely belongs to that Government now. And his statement implies that he is of the opinion that the Government of India does have hostages through its ESI Scheme and not clients. But, the employers through whom and with whose active co-operation the scheme is run, would not and cannot say that they are held hostages. The ESI Act is not a compulsory provision. Because, the employers are free to get themselves and their employees totally exempted from ESI coverage. Sections from 87 to 91-AA deal with exemptions. If the employers are able to provide benefits which are ‘substantially similar’ or ‘superior’ to those provided by the ESI Corporation, they can, as a matter of right, demand exemption from coverage under the ESI Scheme. It is so simple. There is a format in the ESIC offices for this purpose. There are three columns in it. The first one lists out the benefits provided by the ESI Scheme. The next column is to be filled in by the employer recording the benefits that he provides. The third column is intended to be filled by the employer wherein he would say whether, in his own assessment, the benefits provided by him are ‘substantially similar’ or ‘superior’. Let them assess themselves first that way, before coming to the Minister and saying that the ESIC is holding them and their employees hostages. The ESIC had successfully challenged all the employers, on many an occasion, whether they were ready to provide benefits on par with those provided by the ESIC. But, none came forward. 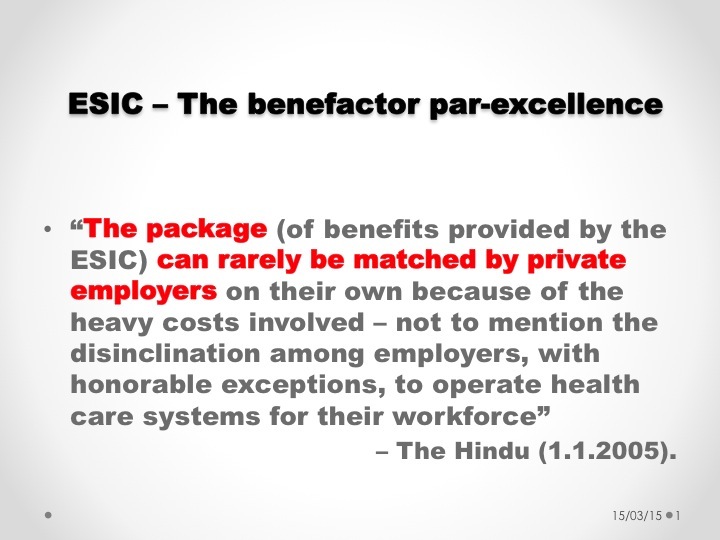 The Private Players do not want to provide all the benefits provided by the ESIC. Their intention is not to provide ‘social security’ but to ‘earn profit and throw a portion of it to all the political parties’. But, ESI Act is for the welfare of humanity. It has kindness in-built. The deficiencies in providing service were and are only man-made and they can be set right by committed leadership backed by the Labour Ministry committed for honesty and transparency in running the organization. “Cleaning corruption is like cleaning the stair-case. It must start from the top”. There had been many an illustrious era that the ESIC has seen in its 63 years of existence, although it had seen many dark spells too. ESIC has the capacity and can make the nation strong economically, if it is well-run. We, therefore, request the Hon’ble Finance Minister not to rely only upon the convenient filenoting submitted by his pliant bureaucrats without studying the 210 years-old poignant and heart-rending history behind the ESIC.